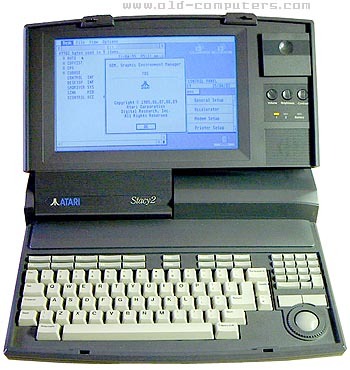 The Atari Stacy is the transportable version of the Atari STf. It has a 9" monochrome LCD screen which can only use the 640x400 graphic mode. The other STF graphic modes can only be used with an external color monitor. It uses 12 small batteries and can be used for five hours. It has the same internal SCSI interface as the Mega STe. Unfortunately it has no energy management. It was a bit big and heavy (more than 7 kg) and will be replaced with the Atari ST Book few years after. The Stacy was developed to use batteries, and the large block in the design on the right side below the display was set to hold 12 'D' cell batteries, but Atari soon found out that this arrangement could only power the Stacey for just a few minutes. Production units had this compartment empty, with no battery contacts inside. Later 3rd party companies would sell rechargeable battery packs (nickel-cadmium in those days) which could be used to make this a true laptop, but the run time was still poor. see more Atari STACY Ebay auctions !